The Central Vigilance Commission and the Central Bureau of Investigation will file an appeal in the Supreme Court against the Delhi High Court judgement setting aside the agency charge-sheet against the Hinduja brothers in the Rs 64-crore Bofors payoff case, the CVC said today. Mr Ashwani Kumar, Rajya Sabha MP from Punjab, said today that any “caution” to the Punjab Government under Article 355 by the Centre would be wholly unmerited. In another indication of easing of tensions along the Indo-Pak border, the Chief of the Air Staff, Air Chief Marshal S. Krishnaswamy, will be leaving for the USA for a 12-day official visit on Saturday during which he will hold discussions with senior defence officials in a bid to further improve the military-to-military cooperation between the two countries. Trinamool Congress leader Mamata Banerjee has given a call for a massive agitation against Railway Minister Nitish Kumar’s decision to bifurcate the Eastern railway and create a new east central railway at Hajipur in Bihar by taking out Dhanbad, Danapur and Mughal Sarai divisions from the Eastern Railway. Women labourers, in traditional Rajasthani dresses, walk to work in the Thar desert near the city of Jaisalmer in Rajasthan on Thursday. 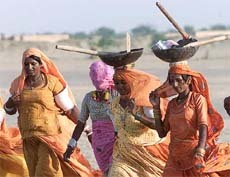 The women often walk long distances in scorching heat, carrying tools balanced on their head. 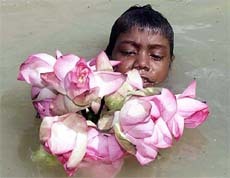 A boy picks lotus flowers from the Hoogly river in Kolkata on Thursday. The Ganga river, called Hooghly in West Bengal, is regarded as sacred and special prayers are offered once a year just ahead of the monsoon. Deputy Leader of the Congress in the Lok Sabha Shivraj Patil today said his party would continue to have floor coordination with the Left and other non-NDA parties in Parliament. Barely 48 hours after their induction into the Rabri Devi ministry, RJD supremo Laloo Prasad Yadav today pulled off a political coup engineering a split in the five-member BSP legislature party with its four MLAs, including three newly inducted ministers, joining and seeking recognition as members of the RJD legislature party. Former Union Minister of State and Bharatiya Janata Party MP from Jharkhand Jagadambi Prasad Yadav, who was convener of the Parliamentary Sub-Committee on Official Languages, died of multi-organ failure in a city hospital today. Uttar Pradesh Chief Minister Mayawati today suspended Barabanki District Magistrate O N Mishra on charges of not hearing the grievances of the people. The Central Vigilance Commission (CVC) and the Central Bureau of Investigation (CBI) will file an appeal in the Supreme Court against the Delhi High Court judgement setting aside the agency charge-sheet against the Hinduja brothers in the Rs 64-crore Bofors payoff case, the CVC said today. Mr Vittal said in view of the high court judgement it had now become important to seek a clarification from the apex court about its 1998 order. According to him, the Supreme Court only suggested that in all major cases involving public servants, the CBI should inform the CVC about the progress of the case and seek its permission before filing a charge-sheet. Before dismissing the charge-sheet against the Hinduja brothers, Mr Justice R.S. Sodhi in his June 10 judgement had opined that the CBI had flouted the prescription of the judgement in the Vineet Narain case by not seeking the permission of the CVC before filing the charge-sheet against the three Hinduja brothers — S.P. Hinduja, P.P. Hinduja and G.P. Hinduja. He also observed that the CVC also did not bother to notice the error. The CBI, which on the same day announced its decision to challenge the judgement in the Supreme Court, felt that if the high court order had its say the stand of the agency in several other cases would also be affected. The CBI said, “Nowhere did the apex court ruled that the agency will have to take the permission of the CVC in all cases,” it argues. In the Bofors payoff case there was only one public servant involved — former Defence Secretary S.K. Bhatnagar — and the agency had sought the permission of the CVC before charge-sheeting him, it says. However, the case against Bhatnagar was abated following his death. The CBI rejected the suggestion made by the Judge that it was free to file a fresh charge-sheet against the Hindujas after following the laid-down procedures and norms. The high court Judge had passed severe strictures against the CBI and the CVC for abdicating their responsibilities and not following the Supreme Court guidelines before filing the “frivolous and half-baked” charge-sheet against the Hinduja brothers. Referring to the memorandum given by SAD-BJP MLAs led by former Chief Minister Parkash Singh Badal to Prime Minister Atal Behari Vajpayee, the Congress leader said in a statement here that allegations about the breakdown of constitutional machinery in the state, rigging in the zila parishad and municipal elections and abetting murder of a political rival by a serving minister, were being made to stall the administrative and legal processes set in motion against a few individuals facing grave charges of corruption and breach of public trust. He said never before had a demand for direct or indirect central intervention in the affairs of state been made in about 100 days of governance of the duly elected government. Pointing to the accusations by the Akali-BJP opposition in Punjab about the state government’s “political vendatta” and “false cases of corruption,” he said that levelling charges and countercharges was a common feature of India’s democracy. Quoting court judgements, Mr Kumar, who is also a senior advocate, said: Any infraction of the due process of law through the device of central intervention under any guise would be an assault upon the delicately nurtured constitutional edifice. “It is obvious that one cannot, consistent with constitutional wisdom, seriously contend that registering of cases under the Prevention of Corruption Act and the Indian Penal Code against individuals charged with corruption in public life would constitute internal disturbance so as to merit intervention by the Central Government under Article 355 of the Constitution,” he said. Mounting a case of breakdown of constitutional and administrative machinery in the state upon a solitary allegation of an alleged political murder at the behest of a serving minister was constitutionally unsustainable in view of a series of judgements by the apex court, including the Bommai judgement, he maintained. The Chief of the Air Staff is visiting at the invitation of his US counterpart General John P. Jumper and during his nine-day stay in the USA he is scheduled to meet senior defence and Pentagon officials, including the Chairman of the Joint Chiefs of Staff, Gen Richard B. Myers, and Admn Thomas B. Fargo, Chief of the US Pacific Command, IAF sources said. “The visit will provide an opportunity to discuss progress made by the two countries in their joint training programmes”, the sources said. While India and the USA had conducted joint exercises by the Army and the Air Force at Agra last month they propose to conduct more joint exercises in Alaska later this year or early next year. The Chief of the Air Staff will also share the American experiences in Afghanistan during his first meeting with General Jumper. The Chief of the Air Staff will also visit various air bases, including the Andrews base, Wright Peterson base, Air Force Command and Control, Training and Innovation Group, Aerospace Operation Centre and Air Education and Training Command. He will also deliver a talk at the Rand Corporation, an American thinktank on defence issues. State of Indo-Pak relations in the wake of the recent steps taken by India to reduce tension will be on the top of the agenda during the visit. The will utilise the opportunity to stress upon the need to put more pressure on Pakistan to put permanent end to cross-border terrorism and infiltration. The Indo-US defence cooperation has seen new heights after the September 11 terrorist attacks in the USA. The two countries have since been regularly interacting with each other at the level of senior officers of the three services. The CPI(M) leadership and the state Chief Minister, Mr Buddhadev Bhattacharjee, welcomed Ms Banerjee’s call and decided to join the Trinamool Congress in the agitation against the Railway Minister’s decision. Ms Banerjee, now in New Delhi, will be meeting the Prime Minister and some other NDA leaders to seek their intervention to persuade Mr Kumar to withdraw the decision, which she alleged was taken to serve certain vested interests. The TMC chief whip in the Lok Sabha, Mr Sudip Bandopadhyya, arrived in Kolkata this morning from the Capital carrying Ms Banerjee’s directives to the party workers and leaders for launching a massive agitation, including rail roko movement against the Railway Minister’s decision to bifurcate the Eastern Railway. The Trinamool Congress also hastily decided to form a union of railway hawkers for strengthening Ms Banerjee’s hand to fight against the Railways. The CPI(M) state unit secretary, Mr Anil Biswas, said they were happy that Ms Banerjee had now decided to fight against the Centre for a right cause. He announced that the CPI(M) workers and supporters would support her agitation. Other partners of the Left Front, including CPI, RSP and Forward Bloc, also decided to extend their support to Ms Banerjee. An all-party delegation of the MLAs of West Bengal will soon visit New Delhi and demonstrate before Parliament against Mr Kumar’s move to bifurcate the Eastern Railway in the name of smooth administration. The Congress and the BJP in the state already protested against the Railway Board’s move to bifurcate the Eastern Railway but they would not join hands with the Trinamool Congress in the agitation as they felt the step was politically motivated and an attempt to put pressure on the NDA to ensure an honourable return for Ms Banerjee into the Union Cabinet. “At the same time, we would try to evolve a consensus with the ruling National Democratic Alliance (NDA) on issues of national interest, such as the presidential poll”. But the consensus would not necessarily extend to the election of Vice-President, he added. He was here on a day’s visit of Gujarat to seek “darshan” of eminent Jain monk Acharya Mahapragya. BSP’s state unit president and Road Construction Minister Rambali Singh and two other ministers Chedilal Ram, Rajesh Singh and another legislator Zakir Ahmad, met Assembly secretary J.P. Pal and submitted a letter addressed to the Speaker seeking recognition as members of the RJD legislature party. They also requested that arrangements be made for their seats in the Treasury Bench. Speaker Sadanand Singh is in Bangalore to attend a conference of presiding officers. He was 78 and is survived by three sons and five daughters. Mr Yadav, who came here on June 11 in connection with an official meeting, had to undergo an emergency major brain surgery after he fell ill. At the hi-tech K.G. Hospital, a blood clot in the cerebellum was removed. Since then, he was in a critical condition. Mr Mishra was found not present on duty by an inquiry team of two secretaries - Mr C B Paliwal and Mr Kunwar Fatehbahadur, in the Chief Ministers secretariat this morning after people of the district complained that the DM was not present to hear their problems in the morning.